If you have ever had your carpet cleaned you know that carpet cleaning is not cheap. You also know that in order to get the best price you have to call several companies for quotes and even then it is just a quote. Once a carpet cleaner shows up to your home the price could change due to the size of your rooms. There could also be extra charges for things such as fuel, deodorizer, and labor costs. So even when you think you found the best price it could be more. Beyer Carpet Cleaning offers savings that only they can offer. Being a family owned business means Beyer Carpet Cleaning can cut prices that anyone can afford. There are no room size limits. There are no fuel fees unless you are more then 30 miles away and there are no labor or additional costs. Beyer Carpet Cleaning knows that you want to save every penny that you can but every once in a while you have to spend those pennies but that doesn’t mean you have to spend them all. With lower prices then their leading competitors Beyer Carpet Cleaning offers specials that fit most customers room situation. Most customers are either looking to get all or most of their rooms cleaned or at least 3 rooms. For just $99.99 you have 3 rooms and hall fully cleaned or for $139.99 you can have unlimited rooms fully cleaned up to 2000 sq ft of carpet. Theses full cleaning services include a steam, vacuum, prespray for spot and stains, and free deodorizer. If you have stairs it’s only $2.99 per step and $5.00 per landing. Beyer Carpet Cleaning’s cost for stairs are on the lower end of the scale. Most carpet cleaners charge separate fees for stairs that can range from $3-$4 per step. Beyer Carpet Cleaning always wants to be fair with their pricing so if you have less then 3 rooms if you give them a call they can always work out a great price that is worth every penny. 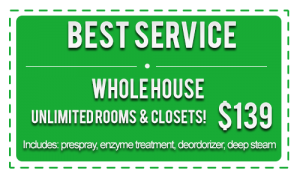 All year long Beyer Carpet Cleaning offers great unbeatable prices. 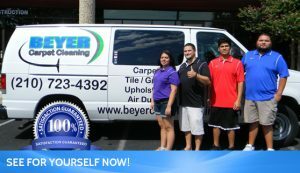 All year long Beyer Carpet Cleaning offers great unbeatable customer service. All year long Beyer Carpet Cleaning offers great unbeatable cleaning from carpet to tile and grout to upholstery. All year long all new customers and military receive a 10% discount on regular priced items. Beyer Carpet Cleaning also offers a customer a customer satisfaction guarantee because they know you will only receive the best cleaning from them each and every time!